Two phtographic exhibits are now at showing at the Irvine Fine Art Center, Irvine, CA (OC), both are available through July 26th. Although I did not make the opening, I did have the opportunity to view the exhibits today. First is ANALOG/DIGITAL III which was curated by Matt Mayand as the introduction states, this is a mix of analog and digital and a mix of things in between. This exhibit includes SUSAN BURNSTINE, THE DANGEROUS AMERICANS, AMANDINE NABARRA-PIOMELLI, HUNTER REYNOLDS, SHELBY ROBERTS, AMY STEIN & ARTHUR TAUSSIG.What made this exhibit for me was being able to see the photographs by Amy Stein, especially her photograph “Watering Hole“. 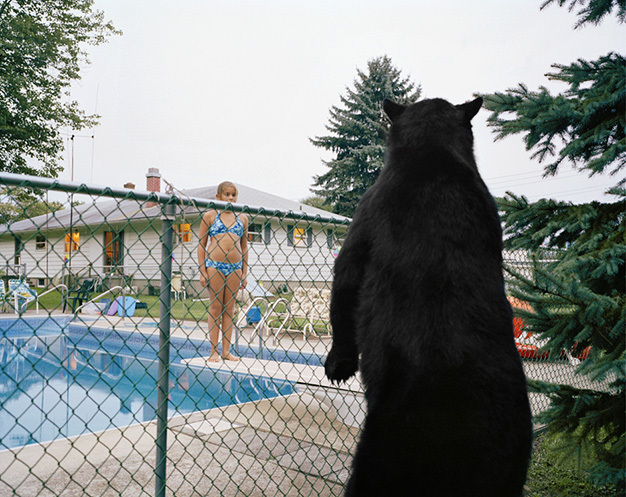 You find yourself really wondering about that bear. Also interesting was the juxtaposition of the Stein photograph “Howl” with the Burstine photograph “The Road Most Traveled“. The second exhibit in the smaller gallery is the Toy Camera Photography Exhibit which is a curated exhibit by Edward Heyman, Jesus Jimenez and Joseph Munoz. As you might suspect, the photographs were made with toy cameras, usually the Holga or Diana. You know that these toy cameras are serious business when you can buy them at the Orange County Museum of Art (OCMA) book store.